Objective of this post is basically to discuss few very important maintenance points in respect of pump operation and maintenance. First of all we will see how we will draw the performance curve of a pump. Pump flow rate will be displayed in gallon per minute or in m3/h over horizontal axis i.e. X axis. Pump head will be displayed in meter or in ft over vertical axis i.e. Y axis. Also find "Cavitation in hydraulic system"
Shut-off head is basically defined as the maximum head that pump can produce. There will not be any flow rate at shut-off head. 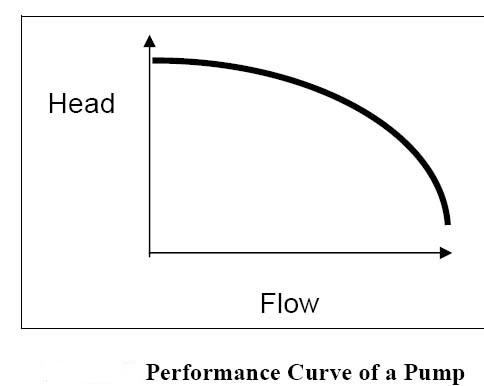 Maximum flow is basically the highest flow that pumps can deliver and at highest flow of pump, head will be zero. 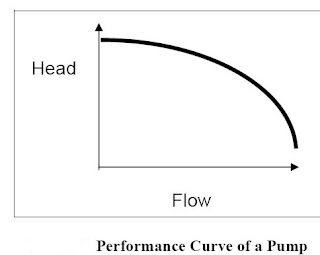 System curve is drawn between flow rate of pump and head to know the required head for given flow rate of pump. 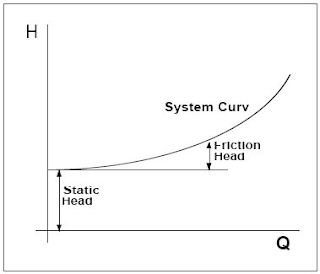 We basically focus over the frictional losses when we consider the system performance curve. 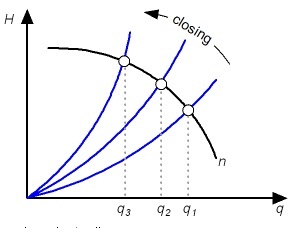 A frictional loss varies with flow rate of pump. Let us see the below curve where we may see the pump performance curve and system performance curve and the intersection point of both curve and this intersection point is called as operating point. 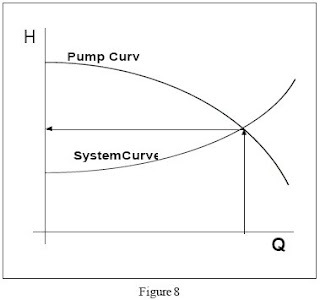 Let us see the each important curve in respect of pump in a single platform. Effect of changing flow rate over the system performance curve. Flow of pump is directional proportional to the thickness of impeller i.e. impeller thickness is higher; flow rate of pump will also be high. Pump head is directional proportional to the Impeller diameter i.e. head will be increased by using higher diameter impeller. If we increase the speed of impeller, we will secure higher head and higher flow rate also. If we are using multistage impeller pump and all impellers are in series, we can enhance the pressure or pump head but the flow of pump will remain same.